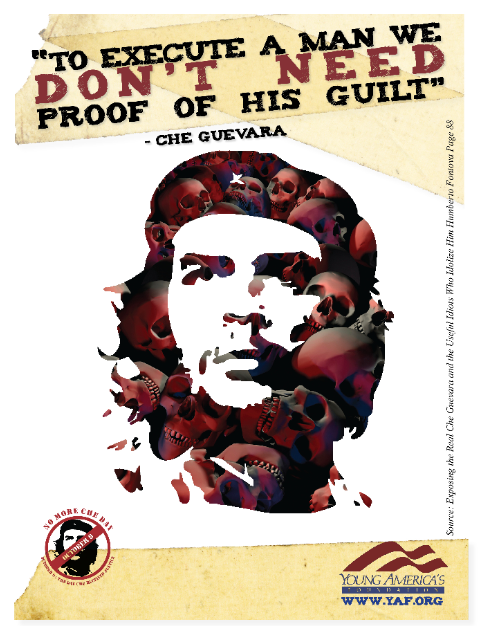 Young America's Foundation has selected October 9 as "No More Che Day." On October 9, 1967 Che Guevara was captured and executed by Bolivian soldiers as he sought to violently overthrow the government of Bolivia using guerrilla warfare. Unfortunately, the Castro regime's propaganda apparatus has spent great amounts of resources in turning an apostle of hatred and political violence into a icon. A generation of military dictatorships arose to combat Guevara's call to liquidate the Latin American oligarchs and plunged Central and South America into a generation of bloody violence and terror. Legitimizing terrorism and total war the legacy of the Argentine communist can be defined by one word: lamentable. Please join students in setting the record straight.